There are a few things in life you can absolutely count on, no ifs ands or buts: food, poop, sleep, and death. Not just your own, but other peoples’. Death is not only devastating, but frustrating, and often very revealing. Sometimes you don’t know just how other people lived until they die, when you are forced to go through their stuff and sort out their affairs. what's inside this teensy tinsy cake-taker? a teensy tinsy serving for four! She left me and Mr. Sarah her cookbook collection. The cookbook collection should have been on a small shelf in her kitchen, but no. There must be hundreds of them. And she never cooked any of this stuff, she always cooked and baked the same family recipes year after year. I just don’t know what I’m going to do with all of these cookbooks. I’ll be giving some away, for sure. She also left me her (regular sized) Tupperware and Corningware/Pyrex collection. 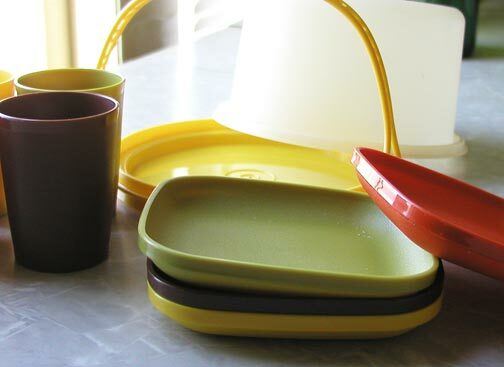 The Tupperware collection was sizeable, and I have no clue how many Pyrex lids there are at my house now. I left some of it behind because I have no need for 5 sepia Pyrex pie plates, or more than one enormous casserole. I’ve never even made a pie. Maybe I should. I’m saving some of this stuff for The Spawn (my step-daughter) when she finally strikes out on her own. For my own sanity, I hope it’s as soon as she turns 18. I’m officially out of room for kitchen supplies. I know me, and know I may not be able to resist enameled graphic milk-white Pyrex bowls if I see them on my rare trips to the thrift store or garage sales. All I know is that I’m in the mood to start shredding stuff and getting rid of things that “I may have a use for in the future”. I’ll keep the things I love and have meaning, but I can’t stand the thought of leaving stacks of paper and pointless crap behind, organized or not, for other people to sort out. I quit going to thrift stores regularly many years ago. Be that as it may, I have a sizeable pile marked for delivery to one of the various charities. I also Went America (invaded and reorganized) all over the refrigerator and the sauce packet drawer, with the help of my new Tupperware. I’m currently eyeballing my clothes closet, where there are stacks of shoeboxes with who-knows-what in them, maybe nothing, and a plastic storage container full of old receipts. I’ll excavate once I get some free time. Mr. Sarah says this whole ordeal has been like a A Very Morbid Christmas. Thanks for reading… I still have a lot of reorganizing to do, but I’m going to try and squeeze in some beads and email. I went through this whole post with a weird smile across my face the whole time, for many reasons. The final picture where you reveal the scale of the serving was the best. Your expression “went America” comes next. I also had an epiphany about where your colors originate from. It’s all Tupperware, Tupperware forever, best of Tupperware pigments (which -as another Tupperware inheritor knows- never fade, EVER). Interesting how feelings toward Tupperware grow, in either direction. 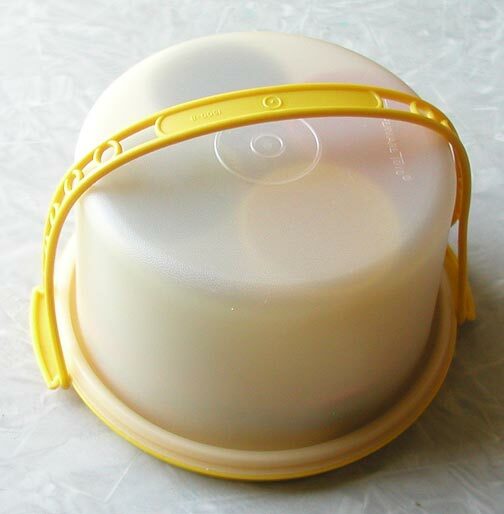 Living at my parents, I wanted to scream every time I opened a cabinet door only to be gifted with the fall of a random Tupperware element. These days I look at my mum’s collection and sometimes admit “Hmmm. This one is actually quite clever” or even think their design rocks. I suspect my dad has been quietly sorting through those humongous piles for the last decade, one lid at a time. We are two peas. 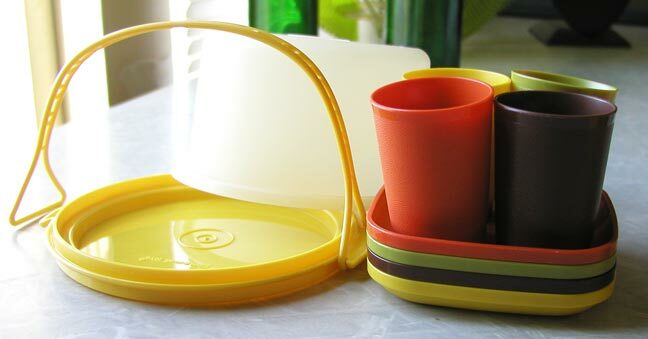 I, too, have been hit on the head countless times by Tupperware lids or bowls. 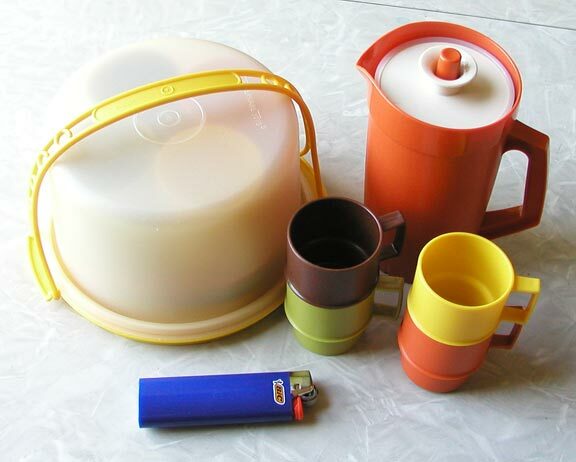 I’m looking at Tupperware online, seeing stuff from my childhood that I’m now surprised (and relieved) not to have found at Charlotte’s. I wonder where it all went. Probably melted on the stove or accidentally thrown away. Going America is a term I picked up from It’s Always Sunny in Philadelphia, but put my own spin on the meaning.